Champneys has four luxury health spa resorts in Bedfordshire, Hertfordshire, Leicestershire and Hampshire. Guests at Champneys resorts can relax in luxurious accommodation, be pampered with the finest beauty treatments and enjoy a wide of fitness and relaxation classes. Each resort has a well-equipped gym, 25m swimming pool, sauna and steam room. Champneys has over 2,800 spa members who are regular users of the facilities. Before using KitLock, Champneys guests had to secure their changing room locker key to their wrists using a key chain. As many guests wear a robe to relax in while waiting for treatments and, as the key chain was awkward to wear on the wrist all day, very often guests would leave their key chains in their robe pockets and many of them ended up getting lost. Champneys decided to remove the key-operated locks from all of their changing room lockers and replace them with KitLock cabinet locks instead. KitLock is a digital cabinet lock ideal for replacing traditional key cam locks supplied with many lockers. It uses a four-digit code rather than a key to operate and secure the locker. Guests simply enter a code, “lock and go”. They are then free to enjoy the facilities without having to carry a key around with them. Champneys has placed instructions on the back of every locker door so that guests can operate the new keypad locks correctly. Members of the fitness team are able to open all the lockers at the end of each day, just to check that property is not left inside overnight and so that lockers free for use again in the morning. The lock is ideal for use on lockers used for short-term occupancy, as they are in many changing rooms facilities. In ‘locker-mode’ function, the lock operates with a single-use code setting facility. The guest enters a four-digit code, that will lock and open the locker only once, then be erased. The locker then remains open until another guest uses it again. 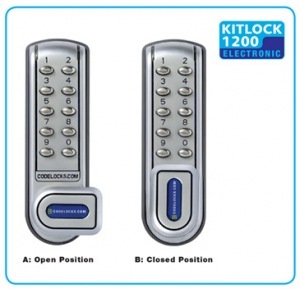 KitLock digital cabinet locks are available to order from Codelocks. Codelocks trained Champneys’ maintenance team to help them install and programme the locks. The installation process involves removing the existing cam lock from the locker and then making an additional top fixing for the KitLock. Once in place, a KitLock will perform 50,000 openings on just two AAA batteries. If you’d like to make keys a thing of the past visit our KitLock website for more information or give us a call on 01635 239645.